Four Dollar Click Review: What! 75 Business Days? Okay, there are many PTC sites out there and their rules can just be a plain miss. Look, I’m not hating on rules however, there are some rules that make me just say I’ll pass. In this Four Dollar Click review, I’m going to explain the 75 days rule along with other info you should know about. At a glance, everything looks all good about FDC until I started reading. I don’t know if anyone attempted Four Dollar Click, but for me, I just saw too many red flags. If you are new to PTC sites, it’s could be the first way that you can make money online but for some, they may never cash out from a particular PTC site. The reason people hit and miss in regards to PTC sites is that it all boils down to who is running the show. Before you ever decide to invest your time on any of these types of systems, you should consider doing your research before you get involved. Knowing the data is important because It could take months for you to cash out for the first time and when some people are ready to do that, some of these PTC sites won’t pay period. That leads you to waste your time looking at ads for nothing and getting nothing out of it. As you already know Four Dollar Click is a PTC site that should pay you to look at ads. Their gimmick is that they have this high paying threshold that is supposed to pay you in the thousands rather than a few dollars for viewing ads on a daily basis. How Does Their Service Works? You can join for free. You get a list of ads that you can look at on a daily basis. You are able to view ads for a certain amount of time. Once that time ends, you get credited $4 for every ad you view. Usually it will take you 20 seconds to view one ads. Once you reach their payout threshold which is $4,000, you automatically have the option to get paid, but there are stipulations to this payout process. What Is This Stipulations To Get Paid? Unlike most PTC sites that pay you a penny or less to view their ads and once you reach $2.00, you have the option to cash out. The PTC sites that do pay wouldn’t even ask you to invest money for the time you put into their systems. The way That Four Dollar Click works is that investments are needed if you want to cash out. You would have to be a paid member for at least three months in order to qualify for the $4,000 payout. They offer different levels and prices for these paid levels. Each level you are able to earn a percentage rate for your referral earnings. There are no refunds if you decide to pay for one of those high priced paid memberships. I don’t know about you, but I feel that there are too many different types of paid memberships. The most inexpensive paid membership is for 1 month at $59.99. There is a 75 day waiting period before you can receive your money and on top of that, you have to be a paid member for 3 months to receive your payment. Some of their memberships such as the Gold LIfetime, you are able to wait 50 days instead of the 75 day waiting period. What’s Up With That 75 Day Waiting Period, Evelyn? I feel you because the 75 day waiting period is alarming to me. With any PTC site, they only give you a certain amount of ads to view. Not only that, you can cash out once you hit their payout threshold. This is a guesstimation, but if you were to click 10 ads per day and get paid $4 per ad you view, you’re looking at the 4th month to qualify to cash out at $4,000. Now you are looking at over two months to get paid because you have to wait 75 day. It will take you 7 months to receive $4,000 for all the ads you viewed on a consistent basis and that waiting period. There might be times where there are fewer ads to view depending on ads distributed on a daily basis. Also, there are people who refer people to FDC, so they might reach that $4,000 threshold a lot faster than someone who doesn’t have referrals. Not Only That, What About The Pay To Cash Out? I feel if you put your time and energy viewing ads, you should be able to cash out without any fees applied, period! If you have to pay money to get your money, you may be looking at some kind of Ponzi scheme. If you look at the lowest advertising fees, I was surprised to see that it cost…! If people are getting paid $4 to look at every ad, that doesn’t cover much. Even if people are paying $179.97 for three months allotted time, how are people going to make their $4,000 when they reach the payout threshold. If they got 1,000 people a day looking at ads, FDC is spending $4,000 a day for people viewing these ads. Then they have to pay their referrals who are viewing these ads. How are they paying people who are viewing these ads, unless many people are breaching their terms and they lose out on getting paid? I’m also not saying that this is the only way FDC are making money but when I saw $4 per ad view, I was expecting advertising costs would be extremely expensive because of the amount of “money” people can make. I always feel that people should feel comfortable when they are finding services that will pay them to do a task. It is so important to figure out if the red flags are alarming or you should keep your guard up. I noticed that on FDC’s website they say they are BBB accredited with an A+ rating. 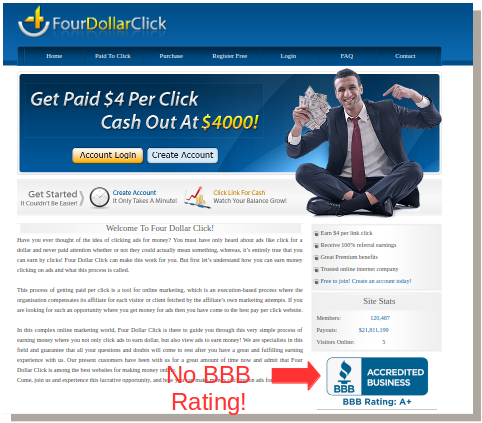 I couldn’t find anything about Four Dollar Click on BBB’s website, yet they have been in business for over 7 years? The payment proof was another red flag. I noticed that they said they pay people every day and some of their payment proof shows PayPal. For some years now, PayPal Prohibits PTC Sites and Traffic Exchange sites. So you’re either looking at very old payment proofs or fake payment proofs. Either way, I have concerns since they say they pay people on a daily basis despite it takes months to get paid. Not only that, if they are paying people every day, I’m also concern about the Ponzi scheme thing that I just mentioned. Let’s go back to PayPal, back then I believe it all started with the Trafficmonsoon scheme going on. PayPal didn’t want to do business with risky businesses. I get why PayPal may prohibit PTC sites because, from my experience, there were many PTC sites that didn’t pay. I feel for the legit ones like ClixSense because they run their business accordingly and paid people when they are able to cash out. I feel that you are risking your time with a Four Dollar Click. Even though they have a high paying click rate and claim people are cashing out on a daily basis, you should look for the red flags. It makes me wonder if they are using a high paying gimmick to reel people in. I feel that you shouldn’t have to pay money to receive the money you earned. I also feel that the cost to get paid cost a lot more than their advertising fees. Not only that, these advertising fees are what is supposed to earn you money. That is why a lot of other PTC sites pay people at a very low rate because, in reality, they are in business to make money. If you have any questions or comments about Four Dollar click, feel free to let me know below, thanks! Looking For Ways To Earn From Home? Check out a list of other opportunities here! Get 10 free lessons to start a blog Here! Is It A Scam To: Beware Of The Sketchy Schemes! Kids Earn Cash Review: Where Are These Kids? Hey Joddy, Lol, great words of wisdom! I don’t know about four dollar click but after reading through the article on it, I am not really convinced that it worth my precious time because earning 4 dollars in 10 seconds for viewing an ad looks unreal to me, secondly, claiming to be accredited on BBB’s and which is not true raise an eyebrow about their credibility and showing a proof of payment to PayPal and which PayPal has placed a ban on PPC site over time now shows their ambiguous intention in paying people. In my opinion, four dollar click is a no. Hey Felicity, same reason why I didn’t take it a step further, after researching and learning what Four Dollar Click had to offer there were too many red flags, thanks for sharing your thoughts, Evelyn. When I saw PTC site, I already stopped. I tried lots of them, and it is simply like this: you invest lots of time, for almost none to zero return. So I give one advice to people, never do it, you have way better alternatives for it, to earn money online. Regardless, thanks for sharing this post with us! Hey Emmanuel, LOL, I’ve done my share too and I feel that the four dollar per ad is just a gimmick to get people to join. Thanks for sharing your advice, Evelyn. Wow! Thank you for this honest and insightful review about four dollar click. While reading the review, I actually thought it was a cool PTC site that honestly pays but when you started pointing at the various red flags, then I realised its just another scam. I also heard about PayPal not being on good terms with PTC sites and I was baffled when I saw the image showing PayPal payments. That seems odd! I don’t know if those payment proofs are old or if they are fake, however the most oddest part is that they ask you to pay if you want to receive payment then you have to wait 75 days after putting in the work that they claim will pay you. Maybe I’m wrong, but it seems to me that getting paid for viewing ads is not a particularly lucrative activity. To then be required to wait for over two and a half months before getting paid those (as well as having to jump a series of expensive hoops to earn more) is over the top. As you say, Evelyn, there are better ways to spend your time and your money. Hey Netta, PTC sites are not a very lucrative way to earn online. A lot of people put time into it risking their time by not getting paid. Thanks for sharing your thoughts, all the best, Evelyn. I’ve always believed there have to be decent opportunities out there and have found that there really are. However, I have to admit that they are rare and Four Dollar Click doesn’t seem to be one of them. To me, it seems like if you ever are lucky enough to actually cash out that $4,000 after 75 days, you’re probably going to end up giving them far more than that in the long run. Thanks for sharing this! I bet you’ve saved some people a lot of trouble by now. Hey Mark, there are times where I was lucky to cash out with a PTC site, then there were times where I wasn’t at all. You made a very valid point and that is people are probably going to end up giving them far more than that in the long run. I feel that it should always be a win-win situation. Thanks for sharing your thoughts, Evelyn. It amazes me when i come across these articles that there are still so many scammers out there promising high returns with little to not input on the user end. Worse still is that people actually fall for these false promises. Thanks for highlighting the issue with Paypal and PTC sites as this is brazen fraud and should be reported to Paypal for false representation. In my experience there is no replacement for consistence and hard work when making money online and while there might be some gems out there that are the exception, this rule has served me well albeit slow. Thanks for a great post and alerting us to this scam. Hey Richard, well said thanks for sharing your thoughts, Evelyn.